A variety of zoisite with a blue to blue-violet colour. 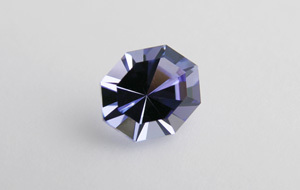 Nearly all tanzanites on the market have been heat-treated to produce this colour. First reported from the Merelani, Lelatema Mts, Manyara, Tanzania. 6 specimens: 0235 — 1.20 ct, Tanzania, Manyara, Lelatema Mountains, Merelani Hills, 3.58333°S 37.00833°E; 0363 — 1.12 ct, Tanzania, Manyara, Lelatema Mountains, Merelani Hills, 3.58333°S 37.00833°E; 0383 — 0.54 ct, Tanzania, Manyara, Lelatema Mountains, Merelani Hills, 3.58333°S 37.00833°E; 0220 — 1.13 ct, Tanzania, Manyara, Lelatema Mountains, Merelani Hills, 3.58333°S 37.00833°E; 0281 — 1.03 ct, Tanzania, Manyara, Lelatema Mountains, Merelani Hills, 3.58333°S 37.00833°E; 0460 — 1.06 ct, Tanzania, Manyara, Lelatema Mountains, Merelani Hills, 3.58333°S 37.00833°E.